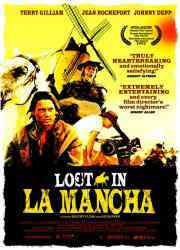 Lost In La Mancha may be the first ‘un-making of’ documentary. In a genre that exists to hype films before their release, Lost In La Mancha presents an unexpected twist: it is the story of a film that does not exist. Instead of a sanitised glimpse behind the scenes, Lost In La Mancha offers a unique, in-depth look at the harsher realities of filmmaking. With drama that ranges from personal conflicts to epic storms, this is a record of a film disintegrating. In September 2000, when the cameras began rolling on Terry Gilliam’s adaptation of Don Quixote, the production already had a chequered past including ten years of development, a series of producers and two previous attempts to start the film. Gilliam had achieved the difficult task of financing the million budget entirely within Europe – a feat that would provide him with freedom from the creative restrictions of Hollywood. The uphill journey was not, however, inconsistent with Gilliam’s career: his more than fifteen year history of battling the Hollywood machine had cast him, like Quixote, as a visionary dreamer who rages against gigantic forces. Joining the Madrid based production team eight weeks before the shoot, Lost In La Mancha directors Keith Fulton and Louis Pepe witness the successes as well as the failures. Problems are quick to emerge: the multilingual crew struggles to communicate detailed ideas; actors remain absent as they run over schedule on other projects; and everything from untrained horses to a sound stage – that isn’t sound-proof – threatens the film. But through it all, there is the palpable, mounting excitement that Gilliam’s ideas will finally come to fruition: the crew watch test footage of marauding giants; puppeteers rehearse a troop of life-size marionettes; Gilliam and Johnny Depp brainstorm over the script. By the time Jean Rochefort straps on his Quixote armour, success, though far off, seems almost possible. Not long into production disaster strikes: flash floods destroy sets and damage camera equipment; the lead actor falls seriously ill; and on the sixth day production is brought to its knees. Uniquely, after Quixote’s cameras have stopped rolling, the documentary continues to record events as they unfold: the crew waits, insurance men and bondsmen scramble with calculators and interpretations of ‘force majeure’ and behind it Gilliam struggles to maintain both belief and momentum in his project. In the best tradition of documentary filmmaking, Lost In La Mancha captures all the drama of this story through ‘fly-on-the-wall’ vérité footage and on-the-spot interviews. Gilliam’s plans for the non-existent film come alive in animations of his storyboards, narrated and voiced by co-writer Tony Grisoni and Gilliam himself. And with the camera tests of the leading actors and the rushes from the only six days of photography, Lost In La Mancha offers a tantalizing glimpse of the cinematic spectacle that might have been. Lost In La Mancha is less a process piece about filmmakers at work and more a powerful drama about the inherent fragility of the creative process – a compelling study of how, even with an abundance of the best will and passion, the artistic endeavor can remain an impossible dream.